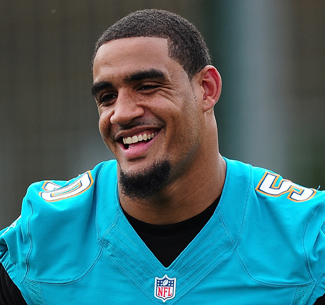 It’s fairly rare for a productive young pass rusher to hit the free-agent market, which is why 25-year-old defensive end Olivier Vernon, entering his fifth NFL season, is one of the most interesting cases this year. The Dolphins placed the transition tag ($12.7 million for defensive ends this year) on the edge rusher, rather than the franchise tag ($15.7 million), thus letting the market determine Vernon’s value. 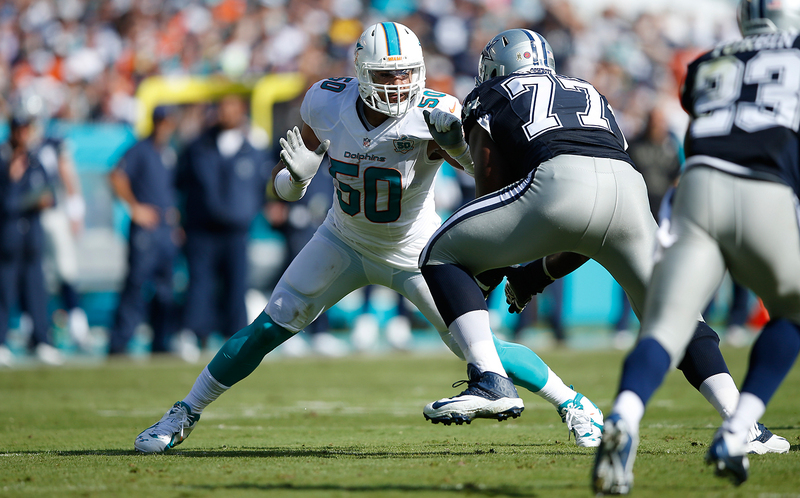 Since being drafted by the Dolphins out of the University of Miami in the third round in 2012, Vernon has led the team in sacks twice, 2013 and 2015, and has 29 total for his sacks in the past three seasons. Last year he led the league in quarterback hurries, with 41, and Pro Football Focus rated him as its third-best edge defender in 2015, behind Von Miller and Khalil Mack. I honestly thought the Dolphins and I would be able to work out a deal. I thought we would find something to agree on. So I didn’t know I was going to hit the free agent market until the day I got the transition tag. It all came down to the stipulations with the salary cap in Miami; they don’t have much room to maneuver. Once I understood that, it started to sink in a little bit, that I probably won’t be here. I’m 25 years old, and for the first time in my life I probably won’t be playing football in Miami. Everybody keeps asking me, “OV, are you nervous? OV, are you scared for what’s going to happen?” I tell everyone that I’m at peace. I know I’m going to be fine wherever I end up playing. I know the kind of person I am and the type of work ethic that I have, and I’ll be all right wherever I go. I think my mom is probably more nervous than I am. I’m just really excited right now because I never thought I would be able to experience being a free agent. I don’t think the reality of it has actually soaked in yet. I guess you could say that it’s like being a kid on Christmas Eve, teams will be bidding on me, me! for the first time in my career. I’m thankful for the opportunity I got when the Dolphins selected me in the 2012 draft, but at the same time, nothing was ever given to me in my career. I didn’t play that much my first year in the league, and I had to work hard to earn my starting role in my second year. And now, I feel like I’ve earned this moment. I’m thankful for the opportunity to play for my home team in my own backyard, but I put in too much work to go for a discount. I’m a Miami guy through and through. I played high school football in Miami, college football at University of Miami and was lucky to be drafted by the team right down the street. I’ve never even lived outside the Miami area. But even so, I made it known to the Dolphins before the season ended that I wasn’t interested in taking a hometown discount. I’m thankful for the opportunity to play for my home team in my own backyard, but I put in too much work to go for a discount. I take that personally. You only get so long to play this game. I just want to have a fair deal, because I know I deserve that. I work hard during the offseason, OTAs, training camp and the whole regular season. Just doing that alone, why would I take a discount? It’s like a boss saying to someone who works 9 to 5 and puts in overtime, “Hey I love your work, you’re working hard, but we don’t want to give you what you’re worth, we want to give you a discount.” Anybody in his right mind would say, no, no, no. Anybody who puts in the time and the work, it means a lot to you, and when you see something that you want, you have to go get it. Vernon has 29 sacks in four seasons, including one against the Cowboys in Week 11 last year. When it comes down to it, it’s a business. As they say, don’t take anything personally when it comes to a business decision. The Dolphins have needs that have to address, and I get that. Former Bills defensive end Mario Williams just agreed on a two-year contract with Miami. I don’t really know what’s going on in their minds upstairs in the front office, but they probably thought to pick up another pass rusher as an insurance policy. Especially if you lose three defensive ends—me, Derrick Shelby and Cam Wake, you really never know. I can’t lie: As I drove up to Sun Life Stadium before our last home game, I considered that it might be my last game for Miami. Since I was a kid growing up, I’d pass that stadium all the time and dream about playing in the NFL. Everybody knew after this game there were going to be a lot of changes, and I knew there was a chance I’d be one of them. When we stepped onto that field in our all-aqua jerseys, none of us cared about our 5-10 record. We didn’t give a damn. We just wanted to beat the Patriots. It was a rough year and there had been a lot of adversity, but that day was different. It was a beautiful day, and the fans were amazing—they were so loud and into the game (they always are when the Patriots come to town). I soaked it all in. I remember thinking, It’s not about who you play against, but the people you play with. That’s the one thing I’m going to remember about playing in Miami—my fellas, my teammates. All I can say to any teams who are interested in me is: Turn on the tape. Watch the film. Miami will always be home, but the idea of moving to another city is kind of exciting. I’ve traveled a lot in my life. My dad is from Jamaica and my mom is from Switzerland, so I would travel there to visit family when I was young, but I’ve never had the chance to live outside the Miami area. There’s nothing wrong with changing the scenery and seeing how people live elsewhere. I know I said earlier that I wasn’t scared, but one thing does scare me: I might have to start shoveling snow for the first time ever. I already know that heater bill is going to be a whole lot of money. Vernon (50) poses with fellow former Miami Hurricanes (from left) Jason Fox, Andre Johnson, Frank Gore, Lamar Miller, Stephen Morris and Phillip Dorsett after the Week 16 Colts-Dolphins game. I’m a man of few words. I let all my actions speak for themselves. So all I can say to any teams who are interested in me is turn on the tape. Watch the film. You pay for what you’ll get. I take pride in being an all-around player. I take pride in stopping the run just as much as I take pride in rushing the passer. Ever since I came into the NFL, everyone talks about how at 6-2, I’m too small. It’s been like that for both me and Cam Wake. Cam and I are probably the smallest defensive ends in the league, but we don’t play like it. Taking that approach has taken me far. My timing in the free agent market couldn’t be better. I know a lot of teams have a ton of cap space and a lot of money to spend this year. My mom has always told me, “Everything happens for a reason.” And she’s always been right. I don’t have any predictions or expectations of where I might end up. I just go with the flow. Whenever you start planning things, they never go according to your plan. I planned out my whole junior year in college, what I needed to do to become a first-round draft pick after that season, and then I ended up getting suspended for receiving benefits from a booster. I missed six games of my junior season, and that suspension had a ripple effect. I was always dreaming about being a first-round pick, a top-10 player, but it didn’t work out like that. I was drafted in the third round, and that opened my eyes. But, again, everything happens for a reason. If that suspension hadn’t happened, I probably wouldn’t have played with the Dolphins and wouldn’t have learned the game like I know it now. I’ve been coached by some great guys with the Dolphins and improved my technique tremendously.